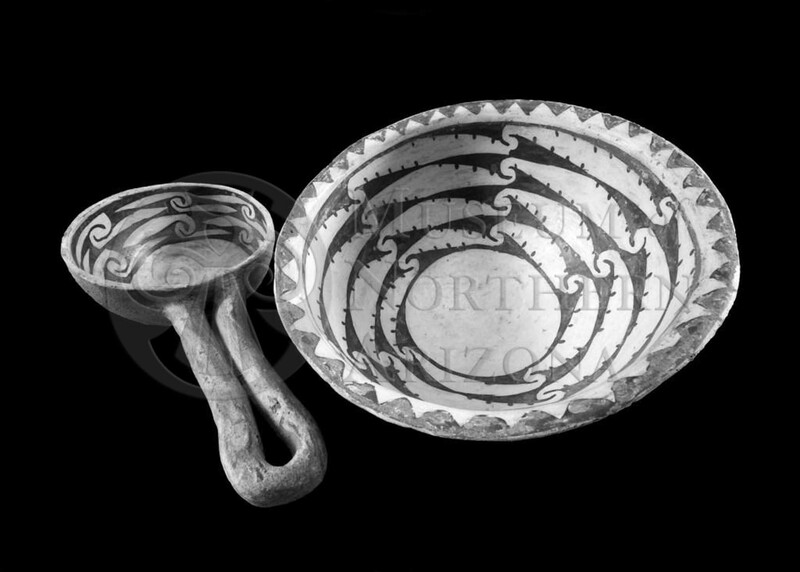 Holbrook A Black-on-white ladle and bowl from the Museum of Northern Arizona collections. Click the image to open the Little Colorado White Ware gallery. Little Colorado White Ware is a black-on-white painted pottery ware made in the Little Colorado River valley from Petrified Forest National Monument to the San Francisco Mountain region, and found in the Tonto Basin, Verde Valley, and upper Gila River drainages. Types include: Holbrook A Black-on-white, Holbrook B Black-on-white, Leupp Black-on-white, Padre Black-on-white, St Joseph Black-on-white, and Walnut Black-on-white. Core Color: Dark gray (due to iron, not carbon) to light gray. Temper: Abundant opaque angular fragments of varying size, mostly fine, usually gray or tan (sherd), quartz grains rare. Surface Finish: Bowl interiors and jar exteriors always coated with a thin white or light oyster gray slip; usually fairly well polished; often crazed; exterior bowls scraped, not well smoothed; often somewhat bumpy, usually pitted; usually coated with thin white slip or wash; not polished; often chalky; jar interiors usually fairly well smoothed. Forms: Jars, bowls, jugs, dippers, ladles, and occasionally eccentric forms. Vessel Thickness: 2.9 to 8.1 mm; average 5.5 mm (bowls); 3.6 to 8.6 mm average 5.5 mm (jars). Paint: Black, usually dense, dull, occasionally thin and watery with brownish tint in most types; sometimes near glaze. Design: Bowl interiors and jar exteriors in all types; rarely on bowl exteriors.